‘Silence’. Maybe you’ve never heard of it. It’s a 1999 club classic, a worldwide hit and has been hailed as one of the greatest trance songs of all time. It still plays in clubs to this day. Whilst watching this video from TAG Yachts recently, I noticed the background music is a remix of that classic. By the nature of the imagery and music in the video, it got me dreaming about luxury yachts. The still picture above is taken from that video and features the TAG 60, which is a high performance cruising catamaran. But what has that got to do with Victron Energy? It’s all well and good having pictures and videos of beautiful women, dreamy music and gorgeous yachts, but someone has to design and build the systems, that make the dream possible. Yacht and system designers have the freedom to choose any supplier they want, but some choose Victron above all others, it seems. Speaking to Peter Bakker, of Bakker Yachting Electronics in South Africa, I soon discovered why it is, that Victron Energy have become the supplier of choice for onboard energy in the new build TAG 50. 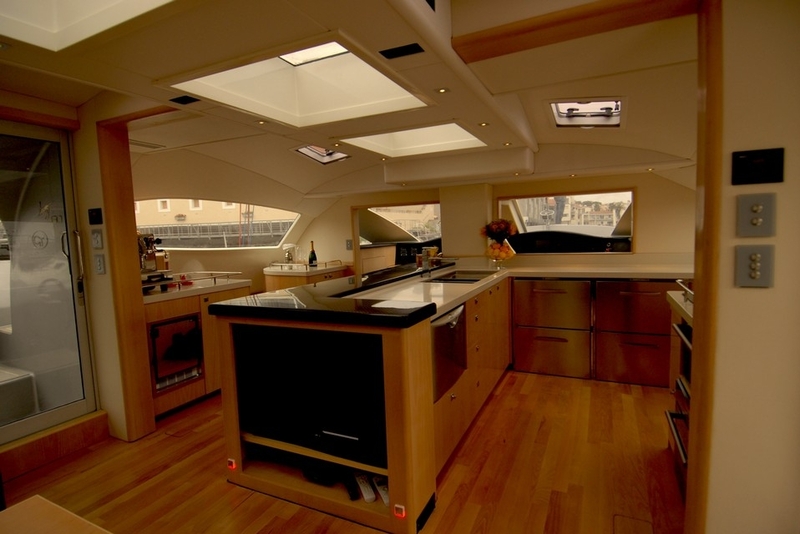 If the galley of the 60 is anything to go by, then all those integrated background power systems that ensure seamless energy unlimited onboard, should make the new TAG 50 equally special, particularly as TAG Yachts have specified 4 x 4.75 KWh Victron Lithium-ion 24V 180Ah battery systems as standard on the TAG 50 XR. Here then, in Peter’s own words, is why Victron have been chosen. “I have been working with Victron equipment for over 25 years and that in itself is something to celebrate. The reason though for choosing Victron products, for these catamarans, is because we can leave TAG’s basic design principles as they are, due to the flexibility a Quattro inverter/charger offers to a system designer like myself. Quattros are the energy control center in every boat and they are just wonderful, as they shrink the amount of equipment needed into a much denser and compact footprint, then ever before. The Quattros we use vary from: 3 KW to 5KW and up to 8 KW. Having basically identical electrical layouts in every boat makes installation so much easier. All we have to do, to suit the needs of the customer, is install the differing equipment capacity to suit the larger energy demands. The new TAG-50 comes in 3 versions and besides the differing size Quattros, we also fit Victron Lithium Ion batteries, Lynx Ion BMS, CCGX’es, BMVs, Blue Power Chargers, Orion DC/DC converters and Victron Isolation Transformers. Working with one supplier such as Victron, for onboard energy, is so much easier than mixing and trying to match components from many differing suppliers. Thanks to Peter for the background information above. It seems that whilst TAG Yachts have the freedom to choose any supplier and equipment, we’re naturally glad they chose Victron Energy for their first 5 builds of the TAG-50 (possibly more) and wish them the very best for their new designs. Let’s hope they become as popular as that classic tune. Images courtesy of TAG Yachts, South Africa.